general market and pricing outlook for commodities remain positive, albeit with elevated risk. Gross revenue for the year was $60.3bln, about 8% above analyst concensus estimate. Key revenue drivers were high iron ore, coal, and copper prices. Earnings increased 122% to $14bln. Price increases led to a 151% increase, but exchange rates, inflation, energy costs, and increasing operational costs reduced the increase. 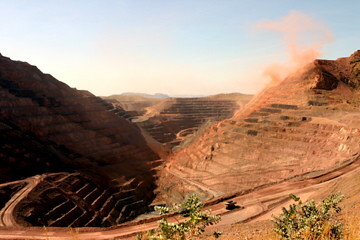 Volumes increased slightly, primarily in the Pilbara iron ore operations. Earnings Per Share of 735$ct are in the range of analyst expectations. Rio Tinto launched an extensive report on the outlook for metals and minerals by Vivek Tupulé, the group’s Chief Economist. The report expresses concern about the high inflation in China and the potential impact of interest rate resulting increases for the resources industry. The prudent growth outlook, framed by both the chief economist and CEO Albanese, refuel the industry debate about the short and long term sustainability of Chinese growth. Shares of Rio Tinto dropped over 2% pre-market in New York (vs. just over 1% for basic materials peers), indicating that worries come as a surprise to part of the investor community. The high commodity prices have helped the company to rebuild a healthy balance sheet. With current level of cash generation the announced share buybacks and the $11bln capital expenditure for 2011 should not impede the company to continue searching and bidding for sizeable acquisitions. The company might benefit from its relative low activity in acquisitions in the past years to gain regulatory and public approval for deals around the world that would currently be harder for rival BHP Billiton to pursue.